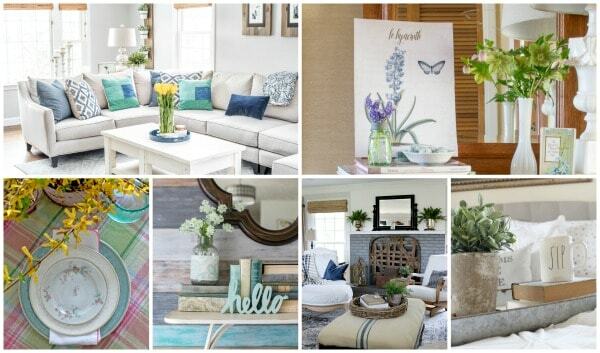 I am so excited to share my Sun Room all styled up for Springtime! Spring is in the air so it’s time for spring cleaning too! 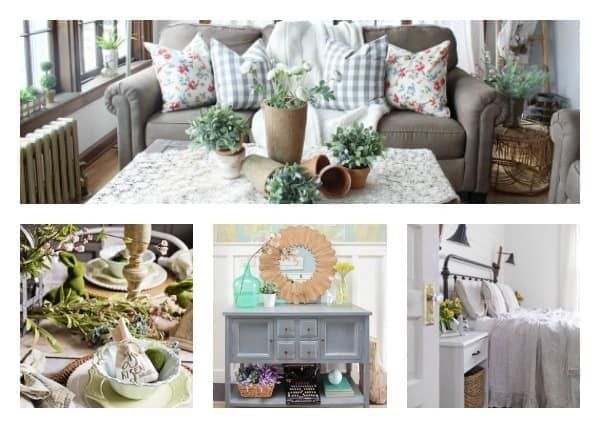 Springtime in the sun room is so fun with all the florals and greenery! I'm also part of a Spring Blog Hop Tour so you will have to go check out all the ladies I am hopping with because their homes are full of Spring INSPO! They are all linked at the end for you. Thank you to Jenna from Wife in Progress for hosting this amazing tour! I wanted our Sun Room to feel like a secret garden & I think I accomplished that! I used almost all the faux greenery & florals I own to create this look, but it's worth it! It's like a flower explosion! OK, let's get to touring this room! Our Sun Room gets a ton of natural light, even on the gloomiest of days, so I wanted to emphasize that by adding lots of floral accents. The windows are what draw you in so I added some cute little galvanized baskets & filled them with faux succulents to make it look like window boxes. I hung up a few box wood wreaths on the window panes to decorate the windows. I always feel like the windows are kind of bare so I like to style them up a bit with signs or wreaths. I kept the couches somewhat the same, but added in some floral pillow covers & these gray check ones from IKEA. I don't like to have too many blankets in the Spring because I think blankets add a lot of warmth & coziness & we want to be thinking warm weather! I did keep my knit blanket though because I love it & we always need at least one blanket! Moving on to the wall across from the windows. This wall is big & long. I recently added in these painted doors behind the couch to take up some space & add some dimension. I decided to bring out the hanging floral garland that I created last year (read about it HERE). I also added in some little wreaths I quickly whipped up. I used some small grapevine wreaths & tucked in some ranunculus. I made sure to have the ranunculus all going the same direction. So the ones on the right of the hanging go to the right & the ones to the left of the hanging go to the left. It gives some movement & life to this giant wall. I placed the wreaths at different heights around the hanging so that it would move the eye around too. Click the images to shop the product. Thank you for touring our Sun Room with me! I hope you got some ideas for Spring! Be sure to hop on over to Shannon, Home Made Lovely next! I think you will love her home too!